Bacterial spot affects peaches, nectarines, apricots, plums, prunes and cherries. The disease is widespread throughout all fruit growing states east of the Rocky Mountains. Bacterial spot can affect leaves, twigs, and fruit. Severe infection results in reduced fruit quality and yield. 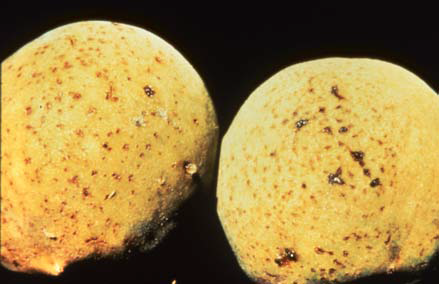 Fruit infection is most serious on late-maturing varieties. If proper environmental conditions occur, up to 50 percent or more of the fruit of susceptible varieties may have to be discarded. Defoliation by bacterial spot may weaken the tree, predisposing it to winter injury and attack by other pathogens. The disease is usually more severe where soils are light and low in fertility. Vigorous trees are usually less susceptible to the disease than devitalized, neglected trees. Figure 1. Bacterial spot on peach leaf. Note the “shot-holes” where infected tissue has dropped out. Small (1/25 to 1/5 inch) spots form in the leaves. Spots are irregular to angular and have a deep purple to rusty-brown or black color. In time, the centers dry and tear away leaving ragged “shot-holes” (Figure 1). When several spots merge, the leaf may appear scorched, blighted or ragged. Badly infected leaves may turn yellow and drop early. Early defoliation is most common on trees deficient in nitrogen or where the disease is further complicated by pesticide injury. 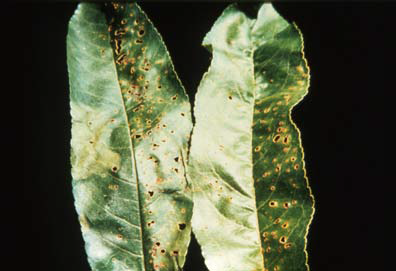 Nitrogen deficiency can cause leaf symptoms that are very similar to those of bacterial spot. Care must be taken to avoid an incorrect diagnosis. In both cases, the leaves of affected trees turn yellow and drop prematurely. With bacterial spot, symptoms are most likely to appear at the tip of the leaf but with nitrogen deficiency, symptoms are usually most evident along the midrib. Leaf tissues surrounding shot-holes caused by a nitrogen deficiency are more likely to have a reddish color than when bacterial spot is involved. Small, round olive-brown to black spots form on the fruit (Figure 2). They are usually sunken and frequently surrounded by a water-soaked margin. On peaches, spots usually form on the side exposed to the sun. Spots may slowly enlarge and merge to cover large irregular areas on the fruit. On some varieties the spots may exude a yellowish gum after rainy periods. Skin cracking and pitting may occur near the spots during fruit enlargement. Fruit infected at an early stage of development are usually the most malformed. Figure 2. Bacterial spot on peach fruit. Note the merging and cracking of spots. On plums, symptoms are different than on peaches. Large, sunken, black spots form on some varieties; on others, small pit-like lesions are common. On peaches, two distinct types of cankers damage twigs. “Spring cankers” develop on young twigs produced the previous summer. Spring cankers first appear as water-soaked, slightly darkened blisters about the time the first leaves appear. If these cankers encircle the twig, it will die. As the season progresses, the tissues over the blister-like lesions rupture and bacteria are released. These bacteria can be spread by windblown or splashing rain and can result in new infections. In time, spring cankers heal and become inactive. “Summer cankers” develop on green twigs of the current season’s growth. They usually occur later in the summer after leaf spots are evident. At first, they are water-soaked, dark purplish spots. In time, they enlarge, turn brown to purple-black, become slightly sunken, and are round to elliptical with water-soaked margins. On certain plum and apricot varieties, twig cankers may continue to develop in two- and three-year-old twigs. If the cankers are deep-seated, they can deform or kill the twigs. Bacterial spot is caused by the bacterium Xanthomonas pruni. The bacteria overwinter in twigs that are infected late in the season about the time leaves are shed. The following spring, when environmental conditions are favorable, bacteria ooze out onto the surface of these twigs. The bacteria are then spread by windblown or splashing rain and can result in new infections throughout the growing season. The bacteria come in contact with healthy leaves, fruit, and current-year twigs and enter the tissues through stomata or lenticels when surface moisture is present. Once inside healthy tissues, the bacteria multiply and disease develops. Warm temperatures (70 to 85 degrees F, 21 to 29 degrees C) with light rains, heavy dews, and windy weather are most conducive for disease development and spread. The disease makes little progress when weather is hot and dry. When planning an orchard, avoid low-lying or shaded sites with poor air circulation and soil drainage. Any practice that promotes faster drying of fruit and foliage will help reduce the risk of infection. Destroy nearby wild or neglected stone fruits (Prunus species). Buy and plant only vigorous, disease-free fruit trees from a reputable nursery. Prune trees annually to allow for better air circulation and to maintain tree vigor. If possible, prune during dry weather in the latter half of the dormant season. Select peach varieties with resistance to bacteria spot. The following varieties are somewhat resistant: Belle of Georgia, Biscoe, Candor, Comanche, Garnet Beauty, Harbrite, Harken, Late Sunhaven, Loring, Madison, Norman, Pekin, Raritan Rose, Redhaven, Redskin and Sunhaven. These varieties are very susceptible: Babygold S, Blake, Elberta, Halehaven, Jersey Queen, Jerseyland, July Elberta, J.H. Hale, Kalhaven, Rio-Oso-Gem, Suncling, Suncrest, and Sunhigh. Fertilize where needed to maintain vigorous but not excessive shoot growth. Spray applications. At present, no spray program is completely effective for controlling bacterial spot. In the home orchard, spraying for bacterial spot is not considered practical. For the most current spray recommendation, commercial growers are referred to Bulletin 506, Midwest Fruit Pest Management Guide. This publication can be obtained from your county Extension office or the CFAES Publications online bookstore at estore.osu-extension.org.